Water is our most precious and limited natural resource that many of us take for granted. While parts of the world are flooded by rains, there are other parts that are in severe drought. Floods and droughts may not impact us in Michigan like other parts of the country, but there are large areas that have been impacted, like the Grand River in Grand Rapids. So what is rainwater harvesting and how can it benefit you? This may look like a typical backyard water feature, but it is part of a larger underground rainwater harvesting system. Rainwater harvesting simply involves the collection and storage of rain that falls onto buildings or roofs, to be used at a later time. The uses are numerous and include; water for gardens, livestock, irrigation, domestic use with proper treatment, and even indoor heating for houses. Harvested water can also be used as drinking water, longer-term storage or for purposes such as groundwater recharge. Provides an independent water supply, if there is a regional water restriction, and also serves as a supplement to the main water supply. Can help mitigate flooding in low-lying areas. Reduces demand on wells, which may enable ground water levels to be sustained. Reduces the need for clean water in irrigation systems. 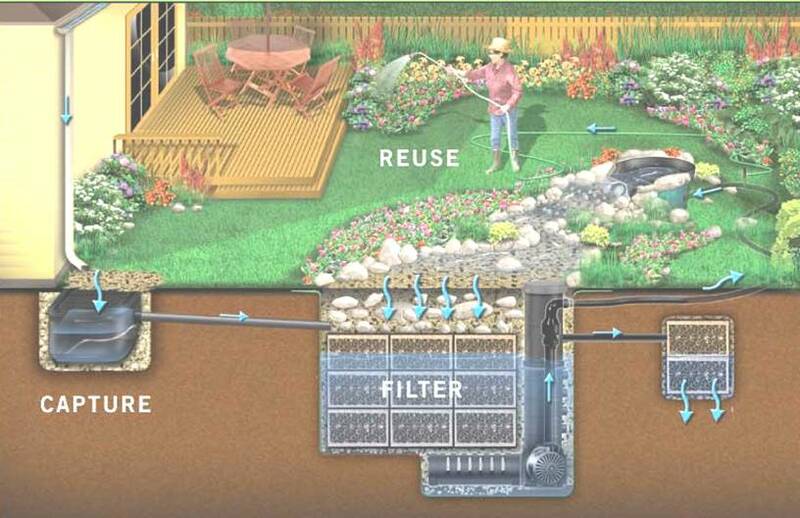 Reduces stormwater in sewer systems. Reduces pollution of freshwater bodies, caused by stormwater runoff. 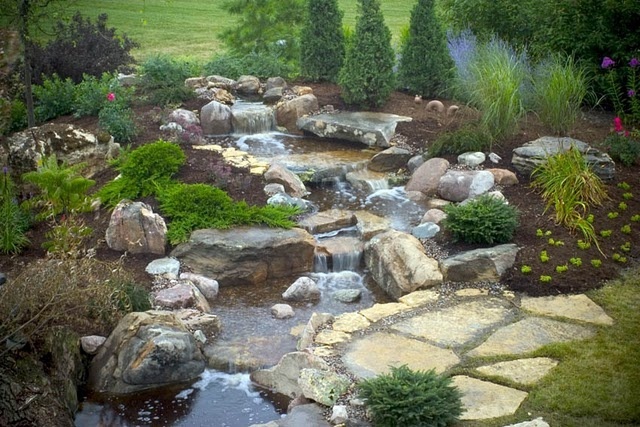 If you are familiar with our pondless water features, our systems work in a similar fashion. There is a ‘capture’ area, attached to the downspout filter, that captures the rainwater. The rainwater then flows through a pipe system into the water reservoir. The water reservoir is comprised of Aquablox, which are situated under a decorative water feature, a pondless water feature (stand alone, or as part of a pond), or under permeable pavers. Since our systems are underground, there is no need for those big bulky barrels that don’t blend with your landscape. Our system will effectively capture rainwater and still create and aesthetically pleasing landscape. Make sure to get the most out of the rain, by adding a rainwater harvesting system to your new or existing water feature!